As a Chamber member you gain immediate access to the "most trusted source for local Information"--the Chamber of Commerce. As a Chamber member you become part of a vibrant group of businesses with the advantage of a local referral network. 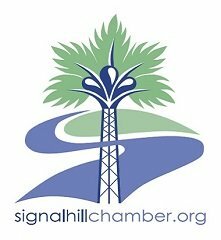 The Signal Hill Chamber of Commerce is known for its networking events and activities throughout the community. Check out our upcoming events to see what we’re all about! The benefits continue to grow when it comes to our chamber. Whether you are a new business in the community looking to plan your grand opening ribbon cutting ceremony or if you are a local organization looking to expand your brand in this community, you’ve come to the right place! From great locations, great food and great members, what more can you ask for. We truly support the needs of our members through providing expert speakers and resources that are extremely accessible. – To advance the general welfare of the Signal Hill area, so that its citizens, businesses, and civic organizations shall prosper. – To advance increased interest and membership in the chamber, by proper marketing, all inclusive social and business events and regular meetings of the Chamber. Reminder to New Members: As a new Chamber member, your first membership luncheon is compliments of the Chamber. Signal Hill has a rich and colorful history. Most famous for the discovery of oil in 1921, and commonly known as an “oil town, the City is now a diverse community with an “oil history” and a bright future. Signal Hill’s first owner of record was Manuel Nieto, who received the land in 1784 as a grant from King Carlos III of Spain. Nieto later divided the land into six cattle and horse ranchos, two of which encompassed Signal Hill: Rancho Los Alamitos and Rancho Los Cerritos. Later purchased by New Englanders, the ranchos were used mostly for grazing and agriculture in the 1800s. A harsh winter in 1862, drought and other financial hardships resulted in the sale of the ranchos to the Bixby clan, who used the land to raise sheep. By the turn of the 20th Century, stately mansions dotted the hilltop, as the value of the panoramic view became evident. However, by 1917 the prospect of striking oil on the hilltop surpassed the value of the view and the Union Oil Company drilled the first oil well in the area. The well failed to produce any oil and it was abandoned. Further exploration was suspended until the Royal Dutch Shell Oil Company resumed exploration and hit pay dirt on June 23, 1921. That first “gusher,” at Alamitos Well #1, marked a turning point in Signal Hill’s history and put the city on the map. Ultimately one of the richest oil fields in the world, it produced over 1 billion barrels of oil by 1984. The field is still active and produced over 1.6 million barrels of oil in 1994 alone. Signal Hill, completely surrounded by the City of Long Beach, had been located in unincorporated Los Angeles County. In 1924, in order to avoid Long Beach’s per-barrel tax on oil, Signal Hill’s founding fathers voted for incorporation. Right from the beginning, Signal Hill proved to be a progressive city, electing Mrs. Jessie Nelson as the Citys first mayor. Oil production continued to be Signal Hill’s mainstay until declining oil prices reduced production in the 1970s. 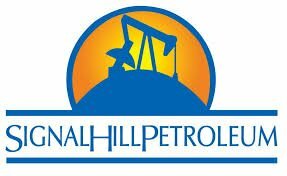 In 1974 the Signal Hill Redevelopment Agency was formed and the city focused on economic development and diversity from oil. Today, Signal Hill is a well balanced, financially sound and economically diverse community of over 11,400 people. This year we celebrate 75 years operating as the Signal Hill Chamber of Commerce! Our strong history, supportive community, and legacy of dynamic leaders has given us a solid foundation from where we continue to innovate and build up the Signal Hill Chamber of Commerce. Many testify of the uniqueness of this chamber. A true genuine nature that resonates amongst its members, family values, but not forgetting a strong business focus and commitment to its members and community. 2594 Cherry Ave, Signal Hill, CA 90755 is offering 10% discount to all members, just mention that you are a Signal Hill Chamber Member. Offering many discounts for ads and other publishing needs. 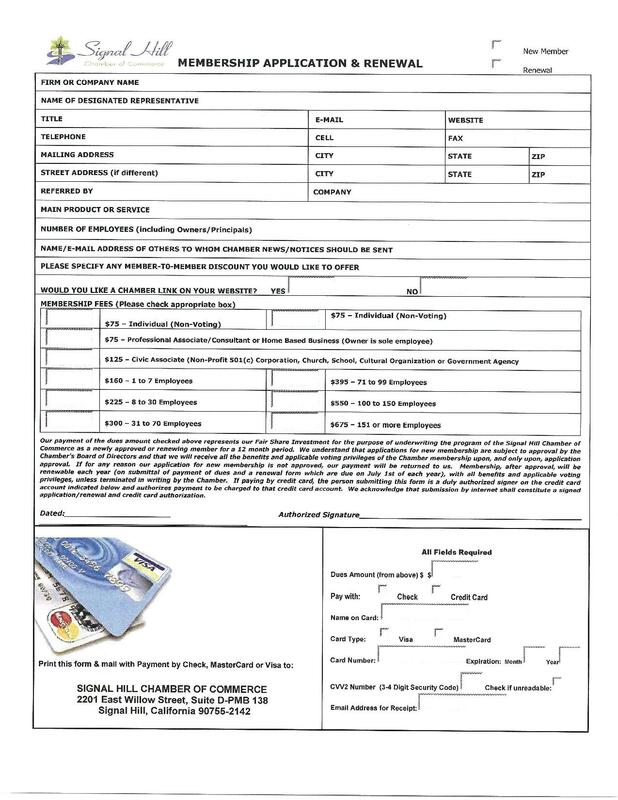 Also, Signal Hill Chamber members can place a business sized card ad in the Chamber section for only $60. Ask Neena and her team for more information. Call (562) 595-7900 or email to newspaper@signaltribune.com.